Why use the Walli-Kids products in Pediatric care? Why use the Walli-Kids products in Pediatric care: waiting rooms, treatment rooms, ER…? In a medical environment and even more in hospitals, kids are often stressed and anxious as everything is new, overwhelming and most often, they cannot relate. They usually have only one goal they can express: “Go Home”. ​In this type of environment they are not who they typically are: dynamic, playful and happy… They need something, somewhere that will catch their eye and attention as they are very inquisitive. What if there was a large, colorful and playful poster in the waiting room or in the ER to distract young patients, to help alleviate their stress and anxiety? Would that help young patients and often their parents to feel a little more at ease by triggering a focus game? Would that help with the waiting time process? Would they feel less wound up when finally meeting the physician? ​​I always told my children there is an easy way and a difficult way to do everything in our lives. To do a chore, a homework, or anything you don’t want to do… choose the easy way and find the positive side in what you have to do. What if you were helping parents to find the easy way when they are at the ER? ​What if this very stressful place had walls decorated with fun and playful posters inviting children to find hidden animals or objects in colorful backgrounds? 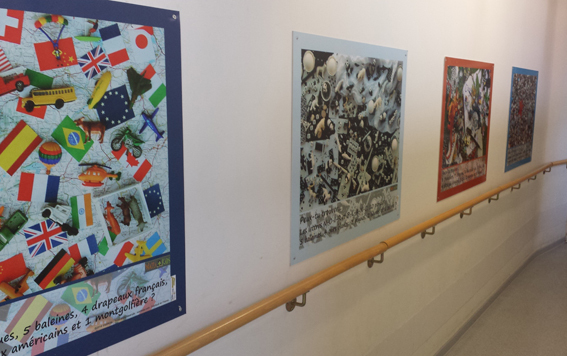 ​It has been proven that art and color play an important role in health. It affects the mood and emotions as well. Upon entering the ER or any waiting room, the young patient and his parents will automatically be drawn to the wall art and forget, for a little while, how unhappy he or she is. Walli-Kids products in their waiting rooms? Frankly, doctor’s waiting room was a place I did not like to go to because of the waiting time and the constant noise. When I had a chance to get prepared, I often had books in my bag and we used the waiting time to read, count or do story telling. It was easier on my kids and myself, and as an extra bonus, time went by quickly. Unfortunately, nowadays, kids and parents are riveted to their mobile phone and there is much less bonding or connection between child and parent or sibling in waiting rooms. One thing has not changed, though, the kids’ attitude when entering the waiting room. So when there is no cell phone handy, young patients are more cranky and difficult in the waiting room. Walli-Kids’ goal is to help by providing a colorful, playful and fun decoration to put on the walls to keep children busy while waiting to see the nurse, and the doctor. Imagine a large, colorful and playful wall decoration for everyone to see upon entering your waiting room! As color and art influence patients’ state of mind, this place might be quieter as children will be focus helping Mitch the Fish find his friends. (from our Animal Buddies Collection). Would that show to parents you care for the wellbeing of your little patients and choose carefully the decoration and the activity they can play? Would that say you value the children’s development progression and choose appropriate activities for your waiting and treatment room? to perform treatments or vaccinations quickly as the patient is busy looking at colorful pictures. Check our Animal Buddies, and Puzzle-Jumbles collections to discover our numerous designs. ​We are running a show special until June 30-2017 - Give us a call! We're SO excited to announce that we now have a blog page! This is where we share any new posters that we create, any exciting news in the Walli-Kids world, and any promotions we have going on. Be sure to check back often for all the latest and greatest updates! 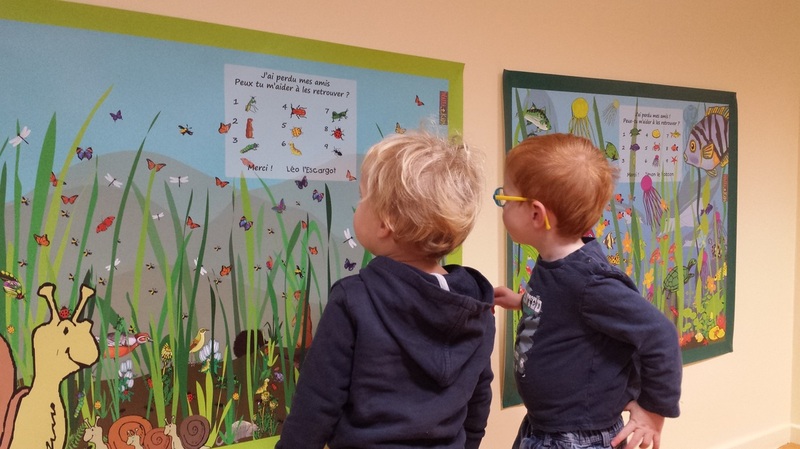 To kick off the blog with a bang, check out these pictures of these little kiddos discovering the Walli-Kids posters! 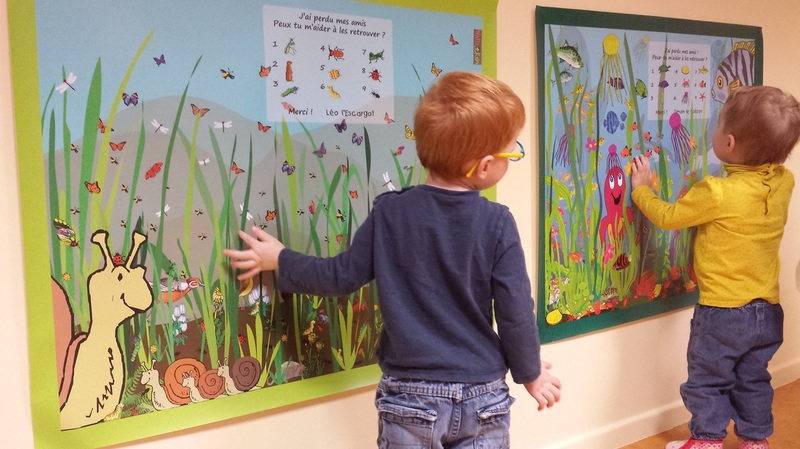 Our French branch of the company got to introduce the Abigail the Snail and Mitch the Fish posters to these sweet little boys and girls. Want to spruce up the walls of YOUR daycare or waiting room? Want to get little ones engaged WITHOUT a phone or tablet screen? Let's chat! We can't wait to hear from you!